The study, published online Sunday in the journal Nature Geoscience, raises troubling questions about the possibility of high death tolls should a large earthquake hit Jamaica, which could cause populated coastal areas to collapse into the Caribbean Sea, and trigger tsunami that would rebound back to shore. John Orcutt, geophysics professor at the Scripps Institution of Oceanography at UC San Diego who was not involved in the study, said the report is a reminder that people on beaches or living near the coastline during a quake should be aware of the dangers of tsunami. After a quake, "if you live along the coastline, you want to be thinking about the potential tsunami hazard and get a couple hundred yards -- a couple football fields up -- just to make sure you’re not going to be in an area that's inundated,” Orcutt said. He said even a 3-foot-high tsunami could bring in a wall of water coming in at 40 mph. "It's nothing to mess with. It's like being hit by a car," Orcutt said. Costas Synolakis, director of the Tsunami Research Center at USC, who was also not involved in the study, said Californians need to be better prepared. "The lesson here is, we really need to prepare for this. Even if they are rare events, they are high-impact events," Synolakis said. Matthew Hornbach, a geophysicist research associate at the University of Texas Institute for Geophysics, said the study helps explain what was observed during the earthquake of a magnitude 7 or 8 that hit Port Royal in Jamaica in 1692, destroying the hub of British colonial interests in the Caribbean Sea. Jamaica and Haiti both lie on top of the Enriquillo-Plantain Garden fault. "During that event, a large chunk of Port Royal sunk into the ocean, and it also experienced a couple of tsunamis," Hornbach said. "It basically devastated the British Empire in the Caribbean for a while. ... A lot of people drowned," he said, some because their houses sank below sea level, and others because tsunami pushed walls of water inland. Much of the city sank into the sea, and 2,000 people, not including slaves, died. The study was conducted to explain a mystery that popped up after the Haiti earthquake: Why were there so many reports of tsunami in a region that wasn't supposed to have many of them? Hornbach said scientists had long expected tsunami to occur from earthquakes generated from "subduction zones," in which one tectonic plate slides underneath the other. Such earthquakes push up the seafloor, moving water up, resulting in tsunami. But the fault that caused the Haiti earthquake was on a fault where one plate pushes past the other, and doesn't push up the seafloor. Scientists had long believed those faults don't often cause tsunami. But what Hornbach’s team found during a visit to Haiti in February and March was that the Jan. 12 quake caused the collapse of both coastal land and underwater sediment. It is those landslides -- both above and under water -- that triggered tsunami that rebounded onto sparsely populated coastal areas of Haiti, killing at least three people and wiping out several homes. For example, near the town of Grand Goave in Haiti, a chunk of shoreline the size of several football fields sank near where tsunami roared ashore. The new study builds on the startling revelation discovered after the magnitude 7.1 earthquake in Papua New Guinea in 1998 that tsunami can not only be caused by huge earthquakes thousands of miles away, but can also be triggered by relatively moderate shaking nearby. The 1998 Papua New Guinea tsunami, which killed about 2,200 people, inspired scientists to map tsunami hazard zones in California, leading to the signs detailing tsunami evacuation routes that have popped up along the coast. Such natively generated tsunami are particularly dangerous because damaging walls of water can begin rushing on land within a matter of minutes after a quake, before authorities can alert the public. 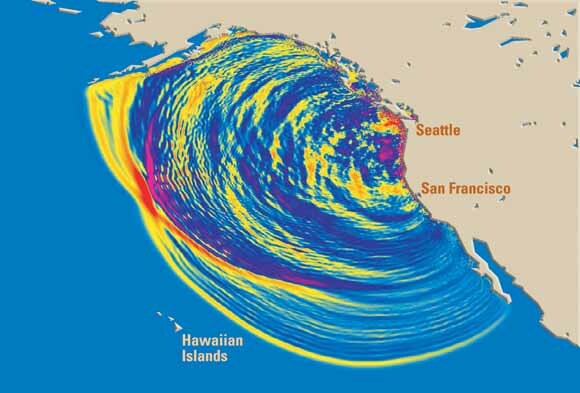 Image: A U.S. Geological Survey graphic simulating a West Coast tsunami. In the computer simulation, tsunami waves are radiating outward after a magnitude 9 earthquake that occurred on the Cascadia Subduction Zone offshore of Northern California, Oregon and Washington on Jan. 26, 1700. The view shows the waves four hours after the quake. The colors indicate wave heights -- red is highest. Along parts of the coast of the Pacific Northwest, 30-foot-high waves rushed inland. Within 20 hours, the tsunami did damage throughout the Pacific, and it is well documented in written records from Japan, the USGS said.